So, I started the Ready-To-Wear fast with gusto!!! I spent the morning of New Year’s Day doing some much neglected mending. Yes, I already own the Kenneth King Craftsy Jeanius course. But I’m terrified to make my own jeans!!!!!!! Why oh why didn’t I notice this before Jan 1? It’s easy enough to fix, though. All you need is a bit of iron-on patch, iron on the inside, then darn it from the outside with thread that matches the jeans. It’ll practically be invisible. I do this all the time with my jeans. Thanks Diana! I had thought about some interfacing on the inside. Do you think that would work? And would you just use poly thread to darn it? I will definitely try that!!!! back to the vintage store! Is that allowed? I don’t think so, mom…. (eek) I think I’m going to have to repair these and then I’ll try to sew my own pair! I’ve fixed this type of whole in my jeans. I just did a patch on the backside with darning stitch over it on the outside. Also, constructing jeans is not hard, fitting them is. If you love the fit of this pair, don’t be scared. 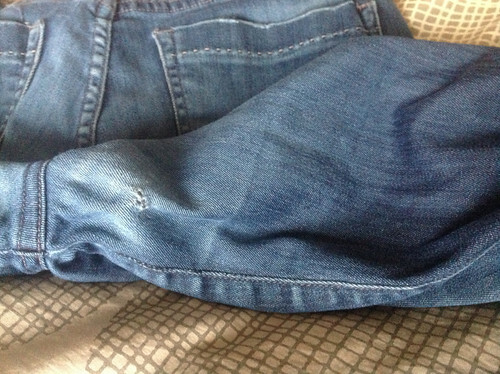 You can definitely make jeans! So glad you have joined in the RTW Fast. So many new faces this time around! Thanks so much for this link, Karen!!!! so, so helpful. I’ll post here about how it goes. I will be anxious to see the finished repair.